The Master Painting Company is looking for experienced craftsmen. If you wish to pursue a career with us enter your contact information on the Contact us page and we will be in touch. My name is Philip Hammond. 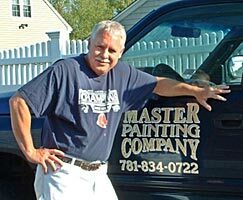 I am the sole proprietor of the Master Painting Company of Marshfield, Massachusetts. My company byline is Fourth Generation Painter. My philosophy is "Give people their money's worth." I have been in business for myself for 20 years on the South Shore of Massachusetts and in the painting trade for 30 years. As a Master Painter, I offer a wide variety of residential and commercial renovation services from power washing to bathroom remodeling. One of my specialties is restorative pressure washing, where years of neglect can be washed away and a new layer of beautiful wood is revealed and can then be properly preserved. I also provide skilled carpentry services to repair and replace damaged wood and restore the beauty of your property. I guarantee that my paint job will last longer than any other previous paint job you have had. I can do this because I take the time to prepare the job right and use the finest materials available for the job. My experience in the field and relationships with manufacturers has taught me which products hold up the best in each situation. How your home is constructed; specifically how well does it breathe? In other words, does it vent moisture well? Preparation and priming. Priming dry wood well is paramount. Quality materials applied under acceptable circumstances in the prescribed method. Without these three, no job will last. With them, they will last only as long as the house and Mother Nature permit. That's why I guarantee I'll give you the longest lasting paint job your house has ever had. I do the proper preparation. I know how to do the job right the first time; and I don't cut corners. There are two reasons that I am qualified to write about this topic. One, I have been a general contractor for the last five years. In that time, I have worked with almost a dozen painters. Second reason: My wife loves to paint our house as a hobby. First of all, there are four types of painting that will need to be done on your home; interior, exterior, trim and specialty surfaces. Let's look at each one separately as the techniques, materials and skills required vary quite a bit. There are several other variables, such as whether or not your home is single or two stories, the over all size of your home and it's age. Interior walls are by far the easiest for most homeowners to do themselves. Wash the walls, patch any holes, cut in the ceiling and roll on two good coats. Sounds easy enough. Until you try to fit this extra work into an already busy schedule. You will also need to buy some supplies that you may never use again, like drop cloths, brushes, rollers, roller handles, paint trays, etc. Older homes often have paint that is oil based, or worse, lead added. These require special materials and preparation. Let's add in a two story home with stairwells and cathedral ceilings and the fun goes right out the window. Professionals deal with these issues all the time and have the skill and knowledge to make sure the end result is the quality paint job you seek.Exterior surfaces can present endless challenges to the DIY painter. Here in Southern California, most of the homes have a stucco finish. This surface is very rough and captures dust and dirt over time. Good painters use a pressure washer to clean out the dirt and knock off the loose paint. Also, depending on the age of the home, there can be a considerable amount of repair that is needed before paint can be applied. If your home has siding or a large amount of wood surfaces that have not been painted in a while, the old paint will have to be scraped off and any cracks filled (we'll talk more about that in the trim section). Again, the multi story home compounds these challenges. Trim can actually be separated into interior and exterior categories. Interior trim like door casings, baseboards and crown molding are usually painted white or some other accent color. This is most often accomplished with a high gloss paint and a brush. There is an art to cutting in the edge of trim in such a way that you don't get trim paint on the wall, or vice versa if the trim is done first. One of my painters, Jeff, is an artist at this, but he has been painting for almost thirty years. Exterior trim, usually wood, suffers a great deal of damage at the hands of the elements. Unless it is painted every three to five years, there will most likely be peeling, cracking and checking (cracks in the wood itself). All of your trim will need to be scraped and holes and cracks filled. This is the time consuming part of doing a good paint job that most home owners either do half heartedly or skip altogether. Remember, your paint job will only be as good as your prep. Specialty painting covers all of the things not mentioned so far. Painting or refinishing kitchen cabinets and other woodwork is definitely not recommended for the amateur. I repainted my cabinets with an airless sprayer and they turned out very nice, but it took me almost three weeks of evenings and weekends and I do have a fair amount of painting experience. If I had really nice cabinets and wanted them refinished with a glaze or a stain, I would hire a professional in a heartbeat. There are also those contractors who specialize in painting concrete to make it look like something else (brick, stone, etc.). The materials, tools and skills for this type of work will be way beyond the reach of the average DIY homeowner. Mural painting and faux painting can give your home a rich elegant look if they are done well. If you want to paint cartoon figures in your child's room, quality is not quite so important. As a matter of fact, let the kids help. If, however, you want a Tuscan countryside viewed through a villa window, unless you are an artist, hire a professional. Faux painting can actually be accomplished with some practice (my wife has gotten pretty good at it), but if you have a large area to cover, two story walls and ceilings or other such obstacles, call in the professionals. Masking off bushes and landscaping, putting down drop cloths and other preparatory steps are necessary to avoid the inevitable mess that painting can cause. Unfortunately, many homeowners are in a hurry or are too inexperienced to make sure all of these steps are taken and often spend more time cleaning up than it took to do the painting in the first place. Painting contractors make a living at their trade because they know the best and most efficient ways to get the job done. That includes preventing costly down time due to spilled or over sprayed paint. They also have a tremendous amount of knowledge about types of paint and how to apply them. If you want quality results, let the pros do what they do best and spend the time with your family. You will be happier in the long run.